Kure Atoll is the most remote of the Northwestern Hawaiian Islands, and the northern-most coral atoll in the world. 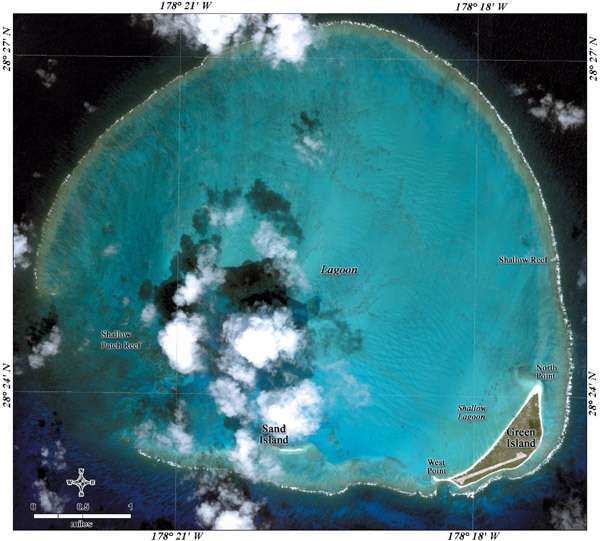 Kure is an oval-shaped atoll, which is 6 miles at its maximum diameter and 55 miles west-northwest of Midway Atoll at the extreme northwest end of the Hawaiian archipelago. Green Island is the only permanent island in the atoll. The island is a nesting area for shearwaters, petrels, tropicbirds, boobies, frigatebirds, albatrosses, terns and noddies. It is also a wintering area for a variety of migratory bird species from North America and Asia. Prior to 1827 Kure Atoll was visited by a half a dozen ships, and given a new name after each visit. Beginning in 1837, numerous ships have run aground on the reefs at Kure (previously known as Cure Island), and crews were stranded on the atoll for up to nine months at a time, eating monk seals, turtles and seabirds to survive while they constructed smaller craft to make the long passage back to the settled Main Hawaiian Islands. Like many locations in the NWHI, Kure is a low and inconspicuous feature, only unreliably located by historic charts of the past, a submerged and often unseen hazard. Some of Hawaii’s oldest known shipwrecks, such as the USS Saginaw (1870) and what may be the whaleship Parker (1842) lie undisturbed at Kure Atoll. On September 20, 1886, the ship Waialeale arrived at Kure and James Boyd took possession of the island in the name of King Kaläkaua and the Hawaiian Kingdom. The ship's crew built a shack and left provisions and water tanks for shipwrecked sailors. In 1894 the island was leased for guano mining, but no mining was ever done. Kure Atoll was acquired by the United States of America as part of the Territory of Hawai‘i on July 7, 1898. In 1909, President Theodore Roosevelt made Kure part of the Hawaiian Islands Bird Reservation, reserving the atoll for the Department of Agriculture as a preserve for native birds. Despite its northern location and relatively cool waters, the aquatic habitats of Kure house a diversity of corals and large invertebrates such as echinoderms, crustacea and mollusks. Twenty eight species of stony corals have been documented at Kure and the atoll has almost 80,000 acres of coral reef habitat. The turquoise waters of the lagoon and near-shore reefs support large schools of dolphins, jacks, sharks, goatfish, and chub, as well as dragon morays, knifejaws, masked angelfish and rare native grouper. Recent aquatic surveys have identified rare fish species and behaviors seldom seen in the Main Hawaiian Islands, raising additional questions about the effects of human activities on marine ecosystems. Kure Atoll is an important pupping and resting area for Hawaiian Monk seals. The Kure Atoll sub-population of monk seals apparently declined during the 1960s due to increased human disturbance from the Coast Guard station, but has been increasing in recent years. The monk seal population size at Kure is currently about 100-125 animals. Other issues facing the atoll include threats from marine debris. The atoll lies in the path of a major Pacific current, resulting in tons of fishing nets and debris washing up on the reefs and beaches, which pose an entanglement hazard for monk seals, turtles, seabirds, fish and lobsters. In 2003 alone 2700 pounds of marine debris was removed from Kure, including 997 pounds removed from accumulation study areas that were cleaned of all marine debris just the year before. These accumulation study areas, called HERZ or High Entanglement Risk Zones, are important indicator areas for how quickly marine debris is accumulating in areas that are known to be frequented by monk seals. Kure is the northernmost coral atoll in the world, placing it at the Darwin Point. Scientists theorize that where coral growth occurs at a slower rate than the subsidence of the atoll, the atoll will sink below the surface with no further possibility of a coral connection. Kure’s coral is still growing slightly faster than the island is subsiding. Further north and west, the Emperor Seamounts foretell the future of Kure and all of the Hawaiian Archipelago. The seamounts lie in water too deep and cool for coral growth. As Kure Atoll continues its slow migration atop the Pacific Plate, it too will eventually slip below the surface.